I fully expected to see this in the library already, but it didn't come up. TED Notepad is a freeware editor for true plain-text. It looks like the original Windows Notepad, but provides many features and tools for quick, easy and advanced editing. The light-weight application fits on a floppy or USB and loads instantly with no installation required. Offers many text-processing functions and tools, many hotkeys and clipboards. You will find several inovative features too. TED Notepad is designed especially for daily writing of plain-text documents and lists. Creating of scripts and html-like files is a joy as well. I can't say for sure if it writes anything to the registry (dont have the tools to check here at work), but it does have an ini file so I assumed not. Last time I looked at it, Ted Notepad writes its settings to the registry. Search for "ted" and look at the section called "Non-portable apps" on the right of the screen. Hover the mouse cursor over "Ted Notepad" to view the reason for non-portability. Wierd, why a program would use an ini file and the registry is beyond me. Then again, I would never use the registery at all so what do I know? Thanks Andrew, I didn't even relize there was a "Non portable apps" list. Last edited by technicolordreamcoat on Wed Aug 16, 2006 2:21 pm, edited 1 time in total. Has this one change because it's in the database as being NOT portable? Last I checked, it writes settings to the registry. It's portable as of something like 5.0.1. If I make error in posting this, I apologize in advance, coz this is my first post. I thought you would like to know that TED Notepad DOES have a portable version now. I've tried many text editors and out of all I've tried, TED Notepad has proven to be the best in so many ways. It even has a feature called "Unique" which is able to find duplicate text lines! It can change cases, it can sort text lines alphabetically. It has so many many features! Below quote from program documentation. The light-weight portable application fits on USB drive and loads instantly with no installation required. Here is the link to the download page for TED Notepad. This link is for the user manual and program documentation. The documentation is extensive and detailed. You should know that Ted Notepad has been in the database for awhile, now (http://portablefreeware.com/?id=858) and I think TPFC is where I first heard of it. You are absolutely right about it being a GEM. I made sure it was a write-in last week on Lifehacker because I think it deserves greater visibility. Unless I need RTF for something, it is the editor I use the most. Don't just search the forums, use the search box on the main page. This will return results from the database and also give you links to forum posts that match the search string. Very old topic update: this is the original TED Notepad (http://www.portablefreeware.com/?id=858) submission topic, so I have now made it its official forum topic. 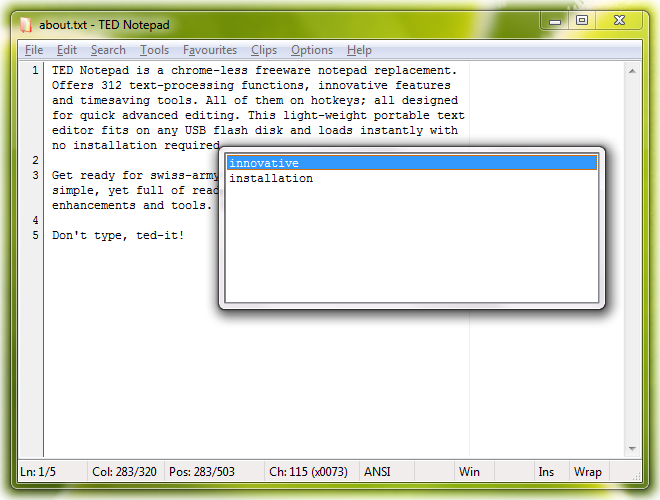 [url]http://jsimlo.sk/notepad/[/url] author wrote: TED Notepad is chrome-less non-bloated free and plain-text editor. No showy toolbars, no sidebars, none of the fancy-looking gadgets. But a simple, neat and KISS interface, stuffed with variety of features, settings and text-transforming tools, waiting on hotkeys and mouse clicks to get useful. It stays out of your way and thus helps you to work on what's important, bringing your typing, text-working or even coding to the next level. Related forum topic: http://www.portablefreeware.com/forums/ ... php?t=4025. @webfork: please amend OP subject to reflect the new status. Thanks. Last edited by Midas on Mon May 04, 2015 6:15 am, edited 1 time in total. Also merged the other submission thread.